Tucked quietly between Florida’s immaculate Gulf coast and the expansive natural Everglades, the golf and country club community of Quail West is everything a home should be – unencumbered luxury, unexpected affordability, and above all, an unrivaled lifestyle that revolves around family, fun, and relaxation. Quail West is widely recognized as one of the premier luxury golf communities in Naples, and one visit makes it clear why. The world-class Quail West Country Club is home to 36 holes of incredibly designed golf by Arthur Hills, the man behind the famous LPGA International Legends course in Daytona, Florida. It is one of the most exclusive golf experiences in Naples, and living in comfort at Quail West gives you that opportunity. Between the community’s grand homes, amazing amenities, and stunning golf vistas, it’s no surprise why Quail West is quickly becoming a staple of Southwest Florida luxury, comfort, and convenience. 71 Properties Found. Page 1 of 2. Quail West features 3 neighborhoods of living excellence, each one offering multiple unique floor plans for every preference and desire. - Escala, luxury villas by Stock Construction: Three floor plans ranging from 2,822 to 3,239 square feet of living space, prices starting at just the mid-$600s. - La Caille, single-family villas by Stock Construction: Six astounding floor plans that range from 2,540 to 3,546 square feet of living space. - Tamworth and Newlands, luxury custom homes by Castle Harbour, Stock Construction, and Florida Lifestyle Homes: These incredible and unique designers offer 14 floor plans ranging in size from 3,000 to more than 4,000 square feet of living space, and starting at just the mid-$700s. Also available to you are specialty custom options from several of the country’s most revered home builders, such as Diamond Custom Homes, Fox Custom Builders, London Bay Homes, McGarvey Custom Homes, and Stock Homes. 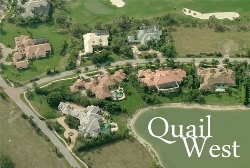 Quail West is focused on getting you the most beautiful and personally unique home possible, and the community has teamed up with these numerous builders to achieve that goal. Situated around two stunning golf courses, the homes of Quail West all have unmatched proximity to the best golf in Naples. The courses, The Lakes and The Preserve, are impeccably landscape wonders of the game, with gently rolling fairways guiding your ball, flawlessly lush greens that roll smoothly and without imperfection, and breathtaking vistas of the community’s many natural lakes and nature preserves. Membership is limited to just 600, so waiting for hours on the first tee is a trying experience you won’t have to go through again. The head professional, Scott Smith, has been with the club since 1993, and there is no one more adept at translating his skills in golf to you, and preserving the rich and elegant history of the club. In the heart of the community is the staple of its luxury and comfort: a massive, 70,000-square-foot clubhouse, home to the fully-stocked golf shop, lavish men’s and women’s locker rooms, a full salon and spa, a wellness and fitness center with multiple classes available, multiple card rooms, 8 red clay tennis courts, a Junior-Olympic style swimming pool, and multiple elegant dining choices. Walk into the lavish Wine Grotto and be transported back to 17th Century Paris, finding yourself in a world of European romanticism and beauty. Or perhaps enjoy a quiet meal with friends at the Mahogany Room, a cozy getaway with exquisite food, impeccable service, and an aura of silent comfort that will make you wish the night never has to end. Perhaps you’ll instead dine at the Grand Ballroom, specially designed for the milestone events in your life, from weddings to birthdays and more. For every special occasion in your life, the Quail West Grand Ballroom is there to pamper and serve you. But for a more casual approach, nothing can beat the Cypress Grille, where the same culinary perfection strived for everywhere else is mixed with casual dining – from delectable salads to the classic burger and fries. From golf to tennis to swimming, eating, and relaxing with friends, Quail West continues to be a symbol of excellence, luxury, and fun.